ized gas  and 100% molecular oxygen enhanced  MRI. Early results with these techniques have been promising. This chapter reviews the basic principles of, and preliminary results with, hyperpolarized gas-enhanced MRI of the lungs. Previous work has shown that the noble gases Helium-3 (3He) and Xenon-129 (129Xe-129) can be polarized using high-intensity laser illumination. This process results in an increased MR signal that is five orders of magnitude greater than thermal equilibrium [6,8-12]. When a conventional MR imaging system is tuned to the resonant frequency of the hyperpolarized gas, high signal can be imaged within the airspaces after inhalation of the agent. 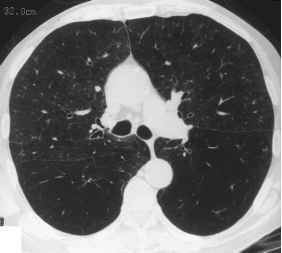 Because the signal is generated by the gas and is not related to T1 recovery time, very short repetition times (TRs) can be used, and complete sets of lung images can be generated in a short breath hold . Helium-3 and Xenon-129 are the noble gases most commonly used in hyperpolarized gas-enhanced MR imaging experiments. Both isotopes have an unpaired electron and have important advantages and disadvantages for MR imaging. Helium is a nontoxic gas that can be inhaled in high concentrations when mixed with oxygen (80% helium/20% oxygen) without adverse effects on tissue oxygenation . Because helium is insoluble in blood, adverse systemic effects do not occur. Unfortunately, the natural abundance of 3He is negligible, so the only available source of 3He is from tritium decay. Thus, the overall supply of the gas is quite limited and consequently, the gas is quite expensive. If hyperpolarized 3He proves to be useful for medical imaging, gas recovery after use will probably be required. (approximately three times less). Second, the levels of polarization of 129Xe, thus far, have not been as high as those achieved with 3He. Thus, the signal-to-noise ratio for imaging with 129Xe is considerably less than that for imaging with 3He for a similar quantity of inhaled gas. Third, because the 129Xe atom is larger and heavier than the 3He atom, 129Xe may not distribute homogeneously but might preferentially accumulate in dependent portions of lung. Although hyperpolarized 3He, at this point, appears to be a better agent for pulmonary imaging than 129Xe, the latter gas has some attractive features for nonpulmonary imaging. Because xenon is rapidly absorbed into blood, it may be useful as an agent for quantifying blood flow, both within the lungs and elsewhere in the body. In particular, it may be useful for measuring cerebral perfusion. And, because its resonant frequency is changed (chemical-shift effect) when it is absorbed into blood, it may be possible to separate gas and blood fractions in vivo, leading to novel methods of quantification. Using spectroscopic methods, hyperpolarized 129Xe may prove useful as a noninvasive probe for measuring tissue and blood oxygenation . For these reasons, most early investigators have used 3He for pulmonary MR imaging experiments, although experience with 129Xe enhanced MR imaging is growing [6,12,15,16]. The authors' experience in human imaging has been with 3He, and most of the following discussion focuses on this agent. The paramagnetic effects of oxygen shorten the T1 relaxation time of hyperpolarized 3He. This potentially results in rapid loss of signal in areas of lung with high oxygen concentration and raises concerns regarding coadministration of oxygen and hyperpolarized gas (see ''Safety Issues'' below). Some investigators have advocated prerinsing the lungs with either the noble gas or nitrogen to decrease this effect. However, as noted below, such techniques may result in potentially dangerous arterial desaturation. Although the T1 shortening effect of oxygen can result in substantial loss of 3He signal in vitro, it is not clear that this is a significant problem in vivo. For instance, Hedlund and colleagues found that mixing inhaled hyperpolarized 3He with equal parts of 100% oxygen, administered by ventilator to anesthetized rats, resulted in only a net 5% signal loss . On the other hand, the T1 shortening effect of oxygen can also be used to some advantage. For instance, because the T1 of 3He decreases in proportion to oxygen concentration in vitro, the loss of signal can be used to noninva-sively measure local oxygen concentrations . This technique could be very useful for mapping local oxygen partial pressures (an indirect indicator of pulmonary perfusion) in patients with various lung diseases . Currently, there are two principal techniques for polarizing 3He and 129Xe: spin exchange and metastability exchange. The technical aspects of these techniques are beyond the scope of this article and are only summarized here. Further discussion can be found in a recent review . Common to both techniques is the use of circularly polarized laser light to polarize a mixture of noble gas and either an alkali metal vapor (spin exchange) or metastable atoms (metastability exchange). In the spin-exchange technique, rubidium atoms are polarized and used to transfer their polarization to the noble gas (either 3He or 129Xe) by a process known as collisional spin exchange (Fig. 1). In the metastability-exchange technique, a layer of meta-stable 3He atoms is created by laser illumination and used to polarize the remaining 3He atoms by collisional spin exchange. The metastability-exchange technique has, thus far, only been successfully used to polarize 3He. Each technique has important advantages and disadvantages for hyperpolarized gas production. The spin-exchange technique uses commercially available laser diode arrays and can be used to polarize either 3He or 129Xe. A relatively compact spin-exchange polarizer is now commercially available and can produce up to 2.0 L of 3He at a polarization level of 25% in approximately 6 to 8 hr. Higher polarization levels for 3He (in excess of 50%) should soon be attainable with the spin-exchange technique in the near future. Polarization levels for 129Xe using the spin-exchange technique are typically lower, between 4 and 10%, but with technological advances, polarization levels may be increased to the 40% range. The metastability exchange technique requires a specialized laser to optically pump 3He—a laser not yet commercially available. This technique also requires pressurization of the gas, which, in the past, required a fairly large compression chamber. However, a more compact metastability exchange polarizer has been recently developed . An important advantage of the meta-stability exchange technique is that it can produce larger quantities of gas at higher levels of polarization and at a faster rate than can be produced with the spin-exchange technique. An important disadvantage of this technique is that it cannot be used to polarize 129Xe. There are numerous differences between MR imaging with hyperpolarized gases and conventional MR imaging of hydrogen protons. First, the MR imaging instrument must be equipped with a broadband radiofrequency (RF) system and a special-purpose RF coil tuned to the appropriate frequencies for imaging 1H, 3He or 129Xe. Most MR spectroscopy equipment works well for this purpose. Second, because the gas is polarized outside the magnet, the level of polarization is independent of field strength. Thus, although most investigators have used 1.5-T magnets, it may be possible to image these gases with lower field strength systems. Third, because there is no recoverable polarization, there is no need to consider T1 recovery in pulse-sequence design. Thus, very short TRs can be used to image the lungs in a short breath hold. Fourth, magnetization of the gas decreases irreversibly during imaging. In fact, a single excitation pulse destroys all gas polarization. Automatic calibration protocols, therefore, cannot be used, and multiple sequences of images cannot be obtained during the same inhalation. For these reasons, most investigators have used gradient-echo sequences with low flip angles and short echo and repetition times to image the gas during a single breath hold. These techniques result in a set of static images that depict gas distribution immediately after inhalation. Dynamic, functional images that depict gas distribution throughout the respiratory cycle can also be obtained at a single level using such techniques. Echo-planar imaging sequences [21,22] or ultrafast gradient-echo sequences  may eventually prove useful for dynamic imaging at multiple levels. We typically image hyperpolarized 3He with a 1.5-T scanner (Signa, revision 5.6, GE Medical Systems, Milwaukee, WI) equipped with a broadband receiver and a specially designed transmit-receive torso surface coil (26 cm long). After positioning the patient in the magnet, fast spin-echo proton MR images of the thorax are obtained in the coronal plane using the following parameters: TR of 3000 ms, TE of 80 ms, 6-mm section thickness, 2-mm gap, 128 X 256 matrix, 32-cm field of view, one signal acquired, and respiratory gating. Following completion of these images, the machine is readjusted for 3He imaging. After the 3He is polarized, it is placed in a plastic bag with an attached tube and an on/off valve. The patient is instructed to inhale the gas and hold his or her breath. Gradient echo images are then obtained in the coronal plane using a TR of 9.5 ms, TE of 3.0 ms, an 8° flip angle, 6-mm section thickness, 2-mm gap, 128 X 256 matrix, 32-cm field of view, one signal acquired. Respiratory and pulse rates, blood pressure, and blood oxygenation levels by pulse oximetry are monitored. Using this technique, a complete set of coronal images is acquired in 12 to 14 sec. Methods for delivery of gas to the MR imaging instrument have not been systematically investigated. In our work, we have used a 1.0-L plastic bag with an attached tube and on/off valve to deliver the gas without significant loss of polarization. This rather simple technique works well because we image patients once during a single breath hold, as have most previous human studies. Studies in anesthetized animals, however, are often performed using either continuous or intermittent gas inhalation, requiring the use of specially designed ventilator systems for gas delivery [17,24,25]. The optimal dose of hyperpolarized gas is also not standardized. Doses administered to patients have ranged on 300 cc  to 2.0 L . The optimal dose likely depends on a number of factors, including clinical indication and gas polarization level. For instance, patients with asthma may require less gas for adequate evaluation of the lungs than do patients with severe emphysema. And, as gas polarization levels increase, the total amount of inhaled gas needed to produce high-quality MR images decreases. Clearly, if hyperpolarized gas-enhanced MR imaging of the lungs proves to be an economically viable and clinically useful tool, more standardized dosing and gas delivery techniques will need to be developed. Studies in patients have thus far suggested that inhalation of up to 2.0 L of 3He is well tolerated and does not cause a significant reduction in blood oxygenation. However, a recent animal study has raised some concerns in this regard. In this study, Ramirez and colleagues evaluated the effects of various gas administration protocols on arterial oxygen saturation in anesthetized, ventilated rats . They found that alternate breath protocols (alternating pure oxygen and noble gas) and single-breath-hold protocols of up to 25 sec did not cause significant decreases in arterial oxygen saturation. However, breath-hold protocols longer than 30 sec, continuous breathing of noble gas, or breath holds of 10 sec or more after a double prerinse (two inspirations of pure noble gas prior to inhalation of the hyperpolarized gas) resulted in deleterious effects on arterial saturation (reduced below 90%). While it is unlikely that patients will be imaged during mechanical ventilation with pure noble gas or even alternating noble gas with oxygen protocols, prerinsing has been advocated to decrease signal loss due to the paramagnetic effects of oxygen (see above). This study suggests, however, that such a technique could well be dangerous, particularly when used with a breath hold of longer than 10 sec and in individuals with impaired pulmonary function. Hyperpolarized gas-enhanced MR imaging has opened the door for various new quantitative measurements of lung function. As noted above, when a controlled amount of polarized 3He gas is administered at known levels of polarization, it is possible to compute maps of local oxygen concentration . Also as noted above, it may eventually be possible to measure blood and tissue oxygenation using polarized 129Xe and spectroscopy methods . Because both 3He and 129Xe have relatively high coefficients of diffusion, these compounds may be suitable for diffusion-weighted imaging techniques. Since in vivo diffusion is restricted by the size of airways and airspaces, such techniques may allow computation of the size of peripheral airways and airspaces. Diffusion-weighted imaging techniques could thus prove useful for detection of abnormalities that increase the size of alveoli, such as early emphysema .